Why have QIPs fallen out of favour? While the Sensex has risen close to 10% in the last three months, a majority of the gains were witnessed in the last one-and-a-half months on positive monsoon forecast for the June-September season. Mumbai: Equity fund-raising through the qualified institutional placement (QIP) route in the first three months of the fiscal year 2016 was at a four-year low as private capex cycle remained slow, leading to low requirement for fresh money. Three companies raised about ₹ 473 crore during April-June as compared with seven companies that raised ₹ 7,460 crore in the corresponding period last fiscal, according to data tracking firm Prime Database. The initial euphoria of the National Democratic Alliance’s (NDA) victory in the 2014 general election seems to have waned, and data showed that the QIP fund-raising has been declining for the last two years. The largest QIP of the period was from Indian Overseas Bank, which raised ₹ 262 crore. Pranav Haldea, managing director, Prime Database, said that such a decline in QIP activity is a worrying sign. Despite a positive sentiment in secondary markets (QIP being a bull market product), not many companies have shown interest in raising fresh capital for growth and expansion. While BSE’s benchmark Sensex has risen close to 10% in the last three months, the majority of gains were witnessed in the last one-and-a-half months on positive monsoon forecast for the June-September season. Investment bankers said the case is also similar for companies choosing to go public with initial public offerings (IPOs). While the number of IPOs have surged, a majority have tapped primary markets to provide an exit, either partial or complete, to existing shareholders, including private equity players, instead of raising fresh money for expansion. Six firms launched their IPOs in the past quarter, taking the tally to 13 issues for the calendar 2016. Together, they have raised about ₹ 8,000 crore, of which ₹ 5,728 crore were raised in the last three months. Last year, 21 firms raised almost ₹ 13,600 crore through the IPO route, the best in five years, data showed. “For QIPs, the banking sector is raising funds as and when they need. Apart from that, infrastructure and metal companies are the ones that usually need to raise funds via the QIP route, and investors aren’t ready to invest in these spaces at this point of time. This is why we have seen a slowdown in QIPs," said Vikas Khemani, CEO of Edelweiss Securities Ltd.
An investment banker with a top American bank said that capex cycle will take about six-to-eight months to pick up. India’s fund-raising is largely dependent on the monsoon which if abundant will boost rural area consumption, encouraging private companies to scale up production and capacity. Weather forecasting company Skymet Weather Services Pvt. Ltd in early June said it expected showers in the 2016 monsoon season at 109% of the long-term average of about 89cm. This was higher than its earlier forecast of 105% in April as well as 106% by government forecaster India Meteorological Department (IMD). “The consumption-themed companies do not need a lot of follow-up capital. Others who want to expand are in a wait and watch mode," said V. Jayasankar, senior executive director and head of equity capital markets at Kotak Mahindra Capital Co. Ltd, explaining the slowdown in fund-raising through the QIP route. Capital markets regulator Securities and Exchange Board of India introduced QIPs in May 2006 with a view to help listed entities raise equity in domestic markets in a faster and efficient manner, with less paperwork as compared with an IPO. 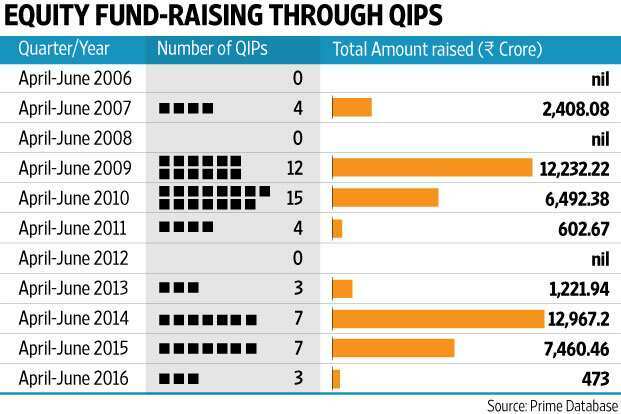 Fiscal 2010 was the best year for fund-raising through QIPs. 67 companies had raised ₹ 43,968 crore by allotting free share to institutional investors, Prime Database data showed.